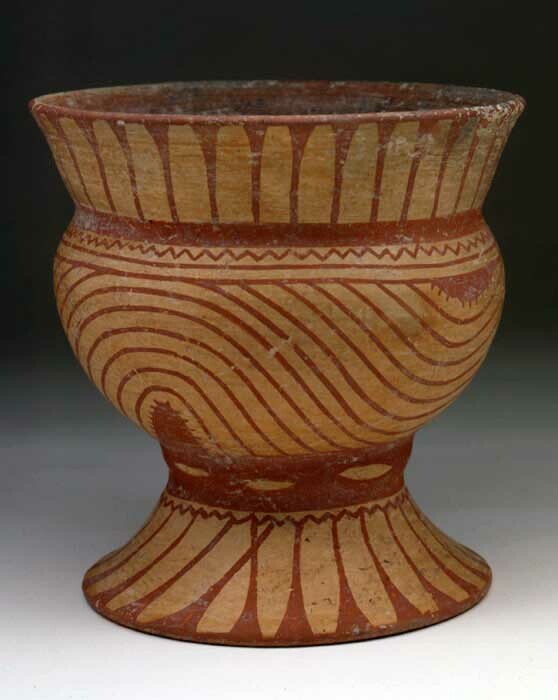 The excavations at Ban Chiang uncovered a previously unknown and aesthetically distinctive ceramic tradition. Ceramic production in Ban Chiang actually stretched back nearly 2000 years before the red-on-buff pottery which gave the site its early renown. Known chiefly from pottery found in burials, the ceramics from even the lowest (oldest) levels of excavation exhibit an elegance, sophistication, and attention to decorative detail that far exceeds mere utilitarian needs. The funerary wares clearly served as an art medium. 1. BC 1630 Pot A is incised, cord-marked, and painted. Early Period. 2. BC 1241 Pot A is cord-marked, incised, and appliquéd. Early Period. 3. BCES Burial 40 Pot A 1934 is carinated and painted on the rim. It was deliberately shattered over Burial 40 and reconstructed after excavation. Middle Period. 4. BCES Burial 76 Pot A 283 and BCES 762/2834, a socketed bronze spear point. These artifacts were found in the flexed grave of a thirty-year-old male. Early Period. 5. BCES Burial 9 Pot F 796 is painted red-on-buff. Late Period. 1. BC 1349 Pot A is cord-marked, incised, and appliquéd. Early Period. 2. BCES Burial 13, which included six pots, four rollers, and the skeleton of a canine. 3. BC 1630 Pot A is cord-marked, incised, and painted. Early Period. 4. BCES Burial 13, which included six pots, four rollers, and the skeleton of a canine.